Galway has a vibrant ecosystem of medical technology startups, multinationals and research centres that in total employs in the region of 8,333 people. Based on the popularity of our recent Galway Tech Map which showed the concentration of ICT companies in Galway City and County, we’ve decided to produce a medtech version to complement it and to highlight the medical device cluster in Galway. 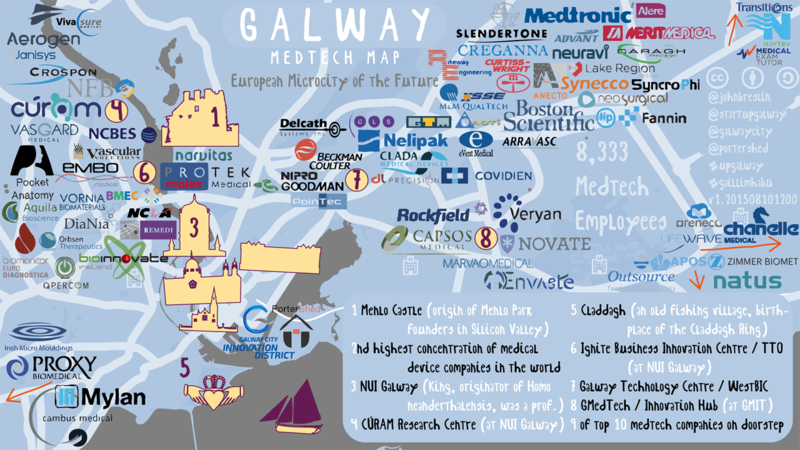 Here is the first version of a Galway Medtech Map that shows the growing medtech ecosystem in Galway, Ireland. If your organisation isn’t on the map, you can download a copy and create your own version as we have released it under a CC By Attribution Share Alike license. The Galway Medtech Map is available in a variety of formats: PDF A0/A1/A2/A3/A4/A5 for posters and printouts, PDF, PNG, bigger PNG. Feel free to share via social media and use in your presentation decks. If you wish to make a suggestion for next year’s version, just email editor@technologyvoice.com with the subject “Galway Medtech Map”. Some interesting facts about Galway’s medical sector are given below, courtesy of the Galway Dashboard from Galway City and Galway County Councils, who commissioned the Whitaker Institute at NUI Galway to undertake an economic baseline study to support the development of an economic plan for the city and county. You can download their full medical sector overview from their website. Galway employs one third of the country’s 25,000 medical device employees and the West accounts for 39% of regional distribution of medical device employees. The medical device cluster in Galway occurs through university-industry linkages, a continuous development of a skilled labour pool, international reputation through the success of Boston Scientific and Medtronic, the growth of supplier firms and knowledge transfers establishing new startups. The medical device companies within this cluster are supported by such organisations as Enterprise Ireland, IDA Ireland, Údarás na Gaeltachta, Local Enterprise Office Galway, GMIT and NUI Galway. Galway has become recognised for its specialisation in coronary devices. The Department of Mechanical and Biomedical Engineering has given rise to an average of 22 graduates per year since 2003. A BioInnovate team recruited in Galway, focusing on cardiovascular disease, identified the need for a vascular support device and technology to improve vascular embolism. REMEDI has recently received €47 million in funding grants for pioneering research initiatives for 36 research projects involving over 200 researchers. GMedTech has obtained over €3.5 million worth of funding for an applied biomedical research project and has developed three cardiovascular type simulators for assessing heart attacks, stroke and aortic aneurysms. A full map of the medical technology sector in Ireland is also available from the Irish Medical Devices Association.